Apple on Thursday issued its first ever synchronized iOS and Android app release in a remote control and setup app for its Beats Pill+, the first Bluetooth speaker to come out of Beats since the company was acquired by Apple in 2014. 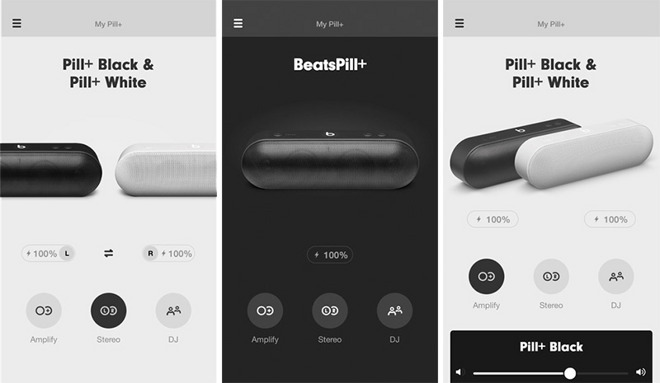 The eponymous Beats Pill+ app lets users take control and share settings with up to two speakers, including software-driven features like stereo sound and a DJ mode. Like similar offerings from UE, Apple's Beats Pill+ allows listeners to pair up two speaker units for amplified mono sound or separate a sound source into left and right channels. In addition, the speaker system can accept up to two Bluetooth sources, meaning users can share playlist control with a friend. Beats Pill+ debuted earlier this month with a larger, sleek design more befitting of Apple's device lineup. As part of the redesign, the speaker ditched USB for Apple's proprietary Lightning cable as a means for charging. Beats Pill+ is free and comes in at 27.2MB from the iOS App Store or 26MB on Google Play.